Till last year, the land hosted Lantana Camera, an invasive plant that often grows into thickets of bushes with clusters of red, orange, pink and yellow florets. Lantana was introduced as an ornamental plant to India in 1800s but has since infested the forests, grazing grounds and farms taking over 13 million hectare, which is around 4 per cent of the total land area of the country. It has little use because the leaves are not eaten by animals while birds and insects take to its fruits thus helping disperse the seeds. The dense thickets elbow out the native species preferred by herbivores, thus greatly impacting the ecology and economics of the place. The Global Invasive Species Information Network identifies Lantana among the top ten invasive species in the world. At Umarwada too, around 35 hectare of private farm land adjacent to the Kanha National Park fell to Lantana affecting the livelihood of people. Ilaichi Bai was one of them. “There was a time when we used to till those uplands, but as the wild animals, especially the boars, started damaging the crop, some of us stopped putting that effort. The farmers who were still keen on growing crops suffered greater losses as the impact of wild animals, which was distributed earlier, got concentrated on their farms. Over the years, everyone left their fields fallow and Lantana took over,” she informs. The farmers started focussing only on growing paddy in the leveled low lands which, though also visited by wild animals, are easier to manage being closer to the habitations. After years of looking helplessly at Lantana taking over their farms, villagers have now joined forces to root it out. Starting in 2016, they have removed the plant from around 22 hectare through combined labour. “It takes around four people to pull out Lantana whose root system is shallow but very dense. 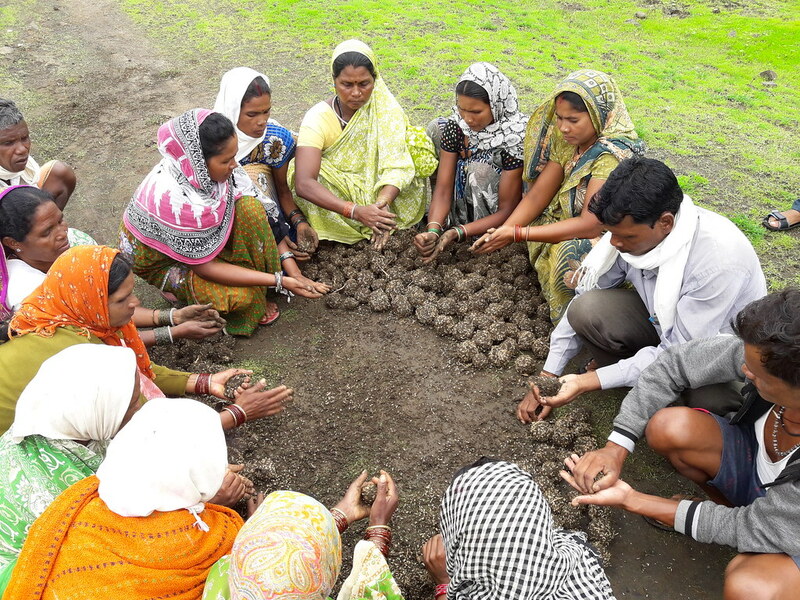 Most families in the village were engaged in this work,” says Tilak Singh Parthi, the president of Prakriti Sansadhan Prabhandhan Samiti, a village committee to manage natural resources that coordinated the work. To start with, the committee first mapped out the whole farm land based on revenue records, marking the fields infested with Lantana. “It was essential to identify the land as many farmers did not remember the size and contours of their farms. 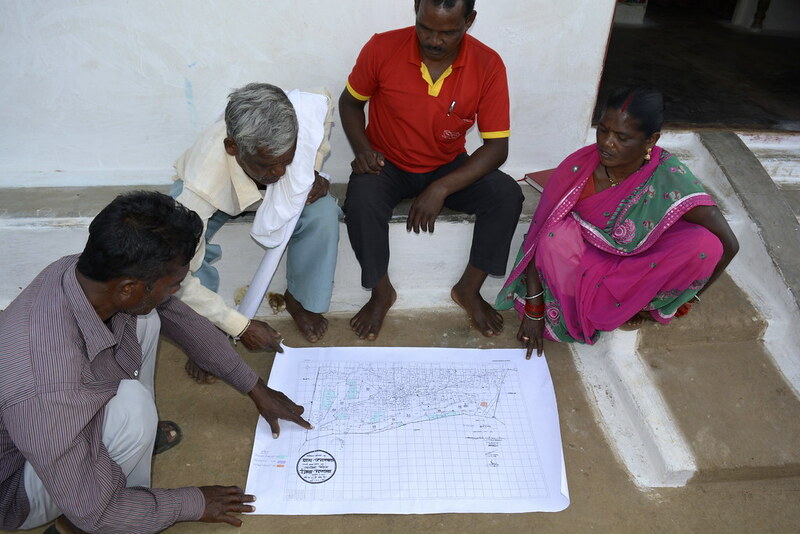 Moreover, mapping helped devise a plan to start the work,” points out Suhas K Hamsagar of the Foundation for Ecological Security, a non-profit organisation that guided the villagers in the process. The organisation also provided partial financial support while the land owners put in 16 per cent of the total cost. Removal of Lantana is problematic as the traditional methods of cutting, burning or haphazard uprooting leads to recurrence. “When the soil is turned during removal exercise, seeds of Lantana lying dormant under the ground get exposed to sun and moisture which aids their germination. When fire is used, the heat breaks the outer shell of the dormant seeds leading to quick germination and hence rapid regrowth of Lantana,” says Dr R Siddappa Setty, associate professor at the Ashoka Trust for Research in Ecology and the Environment (ATREE), who has been studying the spread of Lantana and working towards restoration of the infested land in wildlife sanctuaries. The cut root-stock method, developed by Dr C R Babu of the Center for Environmental Management of Degraded Ecosystem, is the only successful way to clear Lantana. In this method, the root of the plant is cut 3 inches below the ground with minimum disturbance of the soil. The bush is then lifted up and kept upside down to prevent it from gaining ground again. With the land cleared, farmers at Umarwada sowed millets, oilseeds and also went for agroforestry and natural barriers to reduce losses from wild animals. Khamer (Gmelina arborea), Ladia (Lagerstroemia Parviflora) and Bamboo take the lead. Bamboo is being put up as a barrier to prevent animals from entering the fields while Ladia fetches good money as it is used extensively to build houses in the area. “Wild animals will still visit us but if we everyone continues to till their land, the damage will remain distributed. Also, the low lands will be saved from the damage as the animals will have their fill on the upland,” says Parasram who removed Lantana from 3 hectare of his land. The benefits are multiple. “I am growing millets on the land but there’s also increased access to Tendu leaves and Mahua flowers, which were difficult to retrieve earlier due to dense spread of Lantana,” Parasram adds. Considering the high out migration to cities for work, the optimum utilisation of local bio wealth can raise incomes in the villages. “Greater economic benefits are essential to ensure that farmers continue to till their lands and hence prevent recurrence of Lantana infestation,” says Hamsagar. Lantana can re-sprout easily and hence immediate restoration of the land has to be done. While it is easy to plant a crop and weed out any new Lantana growth on private lands, common pastures and forests remain the most affected because the management requires collective efforts by community and government departments. There are a few examples, however, of land reclamation even in these areas. At Indravan village, around 15 kilometres from Umarwada, villagers revived 15 hectares of revenue forest land. After removing the Lantana bushes, they prepared mud balls containing seeds of native grasses and threw them across the land. Grass is best species to restore a land as it spreads rapidly, promotes the soil stabilising microbes and restores the nutrient cycle that helps growth of other species. From being covered by Lantana till five years back, the land now boasts of trees like Teak, Saaj (Terminalia elliptica), Dhawa (Anogeissus latifolia), Bamboo, Amla and Baheda besides several grasses which serve as cattle feed. Earlier, the villagers used to take animals for grazing to the buffer zone of Kanha National Park but there was never enough. “The buffer zone has suffered a lot due to extensive open grazing. Also, it meant we had to spend hours in the forest with the animals when the same time could be used on the farm. Now, we take grass grown on this land and stall feed the animals which also means the dung remains at home to be used as farm manure. During off season when the land has no grass, the animals still go for open grazing in the buffer zone,” informs Devaram Maravi of Indravan. In the Bandipura National Park on the Mysore-Ooty road, Lantana has invaded around 50 per cent of the forest, found a study done by the Nature Conservation Foundation using satellite imagery. The plant thrives especially in disturbed or fragmented locations such as around roads and streams before spreading to the forest interiors. JungleScapes, a Bengaluru-based non-profit has been working with the forest department to restore 100 hectares of the land in Bandipura. The group trained 22 people from local villages in cut root-stock method. Native grass was planted in the cleared area but no plant species was introduced. “We call it passive restoration. The native plants of the area came up on their own after removal of Lantana and we dug trenches to store water that sustained these plants. This ensures that the density of a particular species is in natural order instead of planned plantation based on our learnings which might be faulty,” says Ramesh Venkataraman of JungleScapes. Around 80 per cent of removed bushes are given to villagers for use as fuel wood. Locals have also been trained to make furniture items and small souvenirs out of the wood which are sold in four shops of the area. “The skill helps the villagers earn around Rs 4,000 per month by putting in a few hours every day. We are, however, not able to put a premium on the products which could have funded the ecological restoration work. People are not yet ready to pay that price,” says Venkataraman. Many non-profit groups have learnt from the example and are trying to replicate it in their field areas resulting in restoration of biodiversity and new economic avenues for the people living around Lantana. This story is published with support from the Trans Disciplinary University (TDU)-Nature India Media Fellowship. Views expressed are personal and do not necessarily represent views of TDU or Nature India.